Some toefl listening strategies that will help you get more points . You must be able to understand what lies beneath what the speaker is only suggesting, not directly stating (or asking), about something. Sometimes you need to know the alternate meaning of an idiom or common expression in English. You may also be asked if you understand the speaker’s attitude or opinion about something. To do so requires noticing the emotions conveyed by the speaker. Are they upset or angry or happy or uncertain? Does the speaker seem to like or dislike something? These are your clues to help you answer this type. 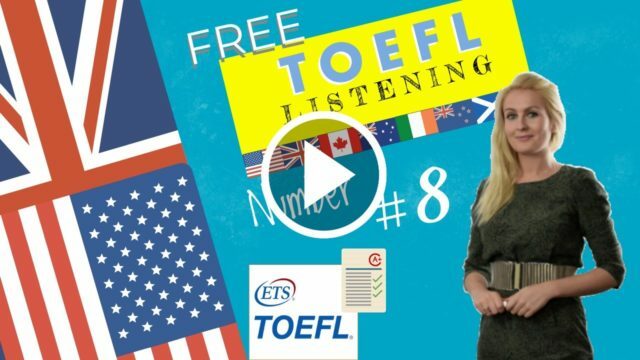 This is an introduction to toefl listening strategies that will help your score. Narrator: Listen to part of a conversation between two students. Student A: (concerned) Did I miss much? Student B: (reassuringly) Not really. Professor White was like, 10 minutes late for class. So we didn’t even get started till twenty after or something. We just, um, we went over the last couple of chapters of The Catcher in the Rye. Student A: Oh, right. I forgot that we were finishing that up this week. Student B: Yeah, and we’re supposed to have, like, the first three chapters of Of Mice and Men read by next class. Student A: I’ve just been, I mean, I pretty much just skim the books because we go into so much detail in class. Student B: I know. Professor White doesn’t leave much out. I guess you don’t really have to, you know, read the novel thoroughly unless you’re going to write a paper on it. Student A: Well, that’s why I’m worried about what I missed yesterday. My term paper is on, you know, the conflict between Holden Caulfield and, um, the authority figures in The Catcher in the Rye. Student B: Well, I can tell you what she went over. Student A: (hesitantly) Oh, OK. Did you take down any notes? Student B: Yeah, I took a few notes. Nothing much though… maybe a page or two. Student A: Oh really? Well, would you mind, I mean, would it be OK if I photocopied them? I could take notes for you next class if you want to work on your History paper, or something. Student B: Sounds good. My handwriting is pretty messy though. You might not even be able to read it. But it would be, it would be great if you took notes for me next class. I could just spend the whole morning in the library. Student A: (relieved, glad to return the favour) Yeah, sure. I have to go to the library after class anyway, so… so why don’t I just meet you there and give you the notes. Student B: Sounds good. Oh, the notes. Umm, I think I have them here somewhere. (searching) Oh yeah, here they are. Right, just a couple of pages. You think you can decipher my writing? Student A: Oh, OK. Did you take down any notes? [heard again]: Student A: Oh, OK. Did you take down any notes? A. He would like to compare notes. B. He would like to borrow his friend’s notes. C. He wants to make sure that his friend’s notes are correct. D. He always copies his friend’s notes. Explanation: The correct answer is, He would like to borrow his friend’s notes. We know from the conversation that Student A missed the American Literature class, and that he is “worried about what (he) missed.” Student B offers to explain what happened in class and Student A then asks if she took down any notes. From this you can infer that Student A would like to borrow the notes. You have to be able to make a logical conclusion based on the facts given in the talk. You may be asked what is implied about a topic or subtopic based from what is provided in the talk, or what is implied by the professor about a topic or concept, or what the speaker might do next. Narrator: Listen to a conversation between a student and a university clerk. Student: Um, hi there. Wow that’s a lot of paperwork! Maybe I should come back another time. Clerk: [Friendly] Oh, come on in. No matter what I do, that pile of paper never gets any smaller anyway. I think it’s cursed. [Laughs] Every time I do a bit, it just replaces itself. Oh well. Now, what can I do for you? Student: Well, I, uh, I got a bit behind on my work this year and I had to drop a couple of classes. So I’m hoping to make it up by taking some summer courses, if possible. Uh, it’s just that I’m not sure where to start. Clerk: Ah. Okay. Well I assume that you’ve never taken summer classes before? [pauses] OK then. Um, the first thing you should know is that they are not scheduled the same way as the classes you’re used to. Uh, the session is shorter, for one thing. Student: Great! Does that mean the days are shorter too? Because um, I sort of tend to lose focus a bit during really long classes. I have a 3-hour class this semester and it’s sort of killing me! Narrator: Listen again to a statement made by the clerk. Then answer the question. Clerk: [Friendly] Oh, come on in. No matter what I do, that pile of paper never gets any smaller anyway. I think it’s cursed. [heard again]: Clerk: No matter what I do, that pile of paper never gets any smaller anyway. I think it’s cursed. A. It is not her fault that her paperwork never gets done. B. She is annoyed that the student is interrupting her work. C. The student has not come at an especially bad time. D. She never tries to tackle the work she has to do. Explanation: (C) is the correct answer. The clerk implies she is always busy, and so the student’s visit is no more inconvenient than it would be any other time. (A) is wrong. She is joking when she says the pile of paper is cursed. (B) is the opposite of what the clerk is trying to imply. (D) is wrong. The clerk says she tries to do her work, but she always gets more. Exam Questions to help with toefl listening strategies.